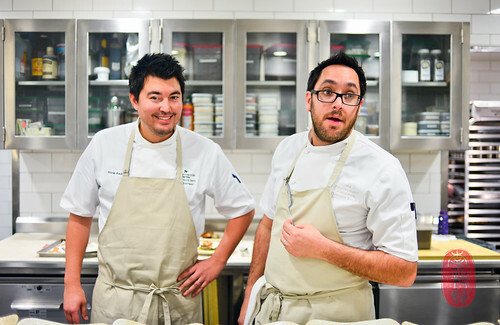 On the ninth of the Twelve Days of Christmas at The Restaurant at Meadowood, Christopher Kostow gave to me Nick Anderer, the chef at Danny Meyers’s restaurant Maialino in the Gramercy Park Hotel in New York City. Anderer and Kostow’s friendship reaches back to the days before either of them was a cook. Anderer was an art history major at Columbia University, and Kostow was a philosophy major at Hamilton College. The two met on a study abroad program in Rome. On the ninth night of the Twelve Days of Christmas, Kostow and Anderer cooked a seven-course dinner paired with wines from Bryant Family Vineyards. Anderer’s cooking at Maialino is inspired by the rustic food of Roman trattorias in Italy. 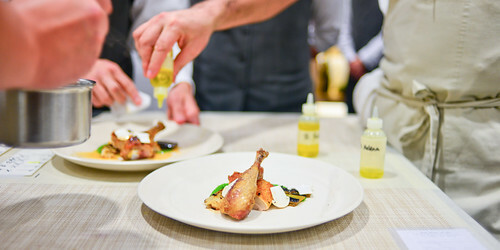 So, for his dinner at the Restaurant at Meadowood, he brought a taste of Rome in the dishes he presented at the Twelve Days of Christmas. Mortadella, bagna cauda (served with baby vegetables from the Restaurant at Meadowood’s garden at the St. Helena Montessori school), and homemade sausages all appeared on Anderer’s list of canapés and dishes. My two favorite courses from Anderer’s side of the menu included his pasta dish, lumaconi (large, snail shell pasta) stuffed with kale and sausages, and coated in a creamy sauce. Servers shaved black truffles over the pasta. It was hearty and comforting. I also loved Anderer’s roasted Four Story Hill guinea fowl, which he served with melted leeks and salsa verde. The Four Story Hill guinea fowl are aged uneviscerated (chef Anderer receives them completely whole, with all of the organs intact), making the meat extremely flavorful. Kostow echoed Anderer with a few Italian-inspired dishes. Kostow started the dinner with a delicate sformato over which he shaved white truffles and dotted with rosemary flowers, lavender-colored crêpe paper blossoms that not only added a touch of color, but a wonderfully fragrant, woodsy scent. Walnut was the theme of Kostow’s cheese course, which put candied walnuts together with black truffle purée, walnut gastrique, shaved walnuts, and pecorino nocino (the cheese is wrapped in walnut leaves). It was rich. It was beautiful. I loved it. For dessert, Daniel Ryan, the pastry chef at the Restaurant at Meadowood, presented a whimsical take on the holiday cake, “bûche de noëls” His cross-section of the “log” was a festive spiral-swirl of butternut squash and chocolate cakes coated in burnt winter spices. The bûche de noël sat on a velvety carpet of crème fraîche and was decorated with bright, cheery cranberries. You’ll find the entire menu from last night’s Twelve Days of Christmas dinner with Nick Anderer, and a slideshow of the dinner below. Kale, sausage, black winter truffles. Four Story Hill guinea fowl, leeks, salsa verde and matsutake. Butternut squash, cranberries, crème fraîche. ~ by ulterior epicure on December 21, 2012.